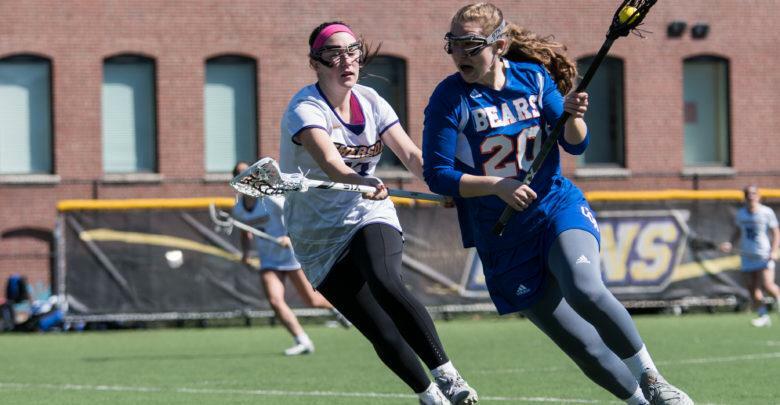 The Emerson women’s lacrosse team had a tough start to their season after losing six nonconference games. Midway through conference play, the team is still hunting for their first win of the season. With four games to go in New England Women’s and Men’s Athletic Conference play, the Lions hold a 0-4 record and are last in the conference, three spots from the final playoff spot. Head coach Kathryn Egizi said that building confidence in their young players will help the team close out the season on a high note. The Lions entered this season with several setbacks to their squad, which made the NEWMAC playoffs as a No. 4 seed last year. The team lost key midfielder Meredith Weber ‘17, who graduated following the end of the 2016-17 campaign. Weber won the 2017 Emerson Athletics Female Athlete of the Year award and scored a career high 63 goals in her final season. Junior midfielder Paige Haley suffered a season-ending ACL injury while playing for Emerson’s women’s soccer team in the fall, an injury that Egizi said affected the women’s lacrosse team. Aside from losing Weber and the injury to Haley, the team also lost 11 players from last year’s squad, with only two seniors graduating. This year’s team has four less total players than the previous year’s squad and features six freshmen. Egizi said the freshmen have stepped up and fill important roles despite their youth. Egizi said she was impressed with freshman midfielders Kelli Mark and Lily Nelson. Mark, who started in all 10 of the Lions’ games, leads all freshman on the team in scoring with nine points coming from eight goals and one assist. Nelson has started in nine games so far this season and has two goals and one assist to date. The Lions will face off against Massachusetts Institute of Technology, Babson College, Wellesley College, and Springfield College in their final four games of the season as they look to avoid their first defeated season since joining the NEWMAC. Egizi said every game is important as they close out the season. The Lions next face off against MIT at Rotch Field on Wednesday at 7:30 p.m.